. kajiya　鍛冶屋 kajishi　鍛冶師　blacksmith in Edo . For "Bellows Festival", see below. This story deals with the preliminaries of Japanese Sword making, the preparation of the metall. First, please reat the following two entries and then come back ! COPYRIGHT © 1997 - 2006 Hitachi Metals, Ltd.
is an ancient Japanese method for manufacturing iron. 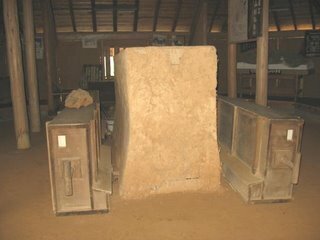 The tatara process has a history stretching back more than one thousand years, being a method for fabricating iron unique to Japan built up through the unceasing efforts of our ancestors. The word tatara itself seems originally to have meant fuigo, or “bellows.” An extremely ancient word, it appears in the second oldest of Japan's mytho-historical documents, the Nihon-shoki (“Chronicles of Japan”). In that early 8th century work, it appears in the name of Hime-tatara-isuzu-no-hime-no-mikoto, the consort to Japan's legendary first emperor Jinmu. The two Chinese characters used for the word are intended to be pronounced as “tatara,” but they can also be read together based on the meaning of each character to create the word “foot bellows” (fumi-fuigo). The princess is said to have been the daughter of Koto-shiro-nushi-no-mikoto, an important god from the Izumo region that is one of the two heartlands of early Japanese culture. In this light, it is extremely interesting that the word tatara using these particular characters appears in the name of a princess from a region that is one of Japan's major iron-manufacturing areas. The furnaces where the manufacturing of iron involved cooling it with a foot bellows also came to be called tatara. In this case, the word is written with a different, single Chinese character. 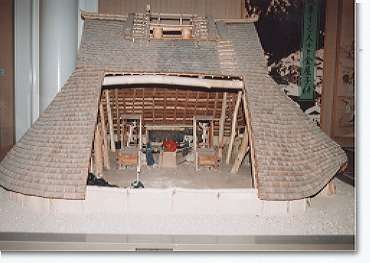 Furthermore, a takadono (a special kind of high-roofed house) containing a single furnace in its entirety, as well as any ironworks factory that includes a furnace of this sort, also came to be called a tatara. High temperatures are required to reduce iron sand and iron ore and obtain iron when using charcoal. The ingredients can be reduced even at temperatures under 1,000°C, but it takes an extremely long time. Moreover, the iron obtained is spongy, and if it is not heated again to a half-melted state forging will be difficult. To efficiently obtain iron requires putting the iron source in a reducing environment, and maintaining the temperature at the melting point of iron sand (approximately 1,400°C) for a long period of time. This is why the bellows, or fuigo, are indispensable as a tool for generating wind. The first bellows to appear in any of Japan's written histories are the ama-no-habuki bellows made from a leather sack, recorded in the Nihongi. 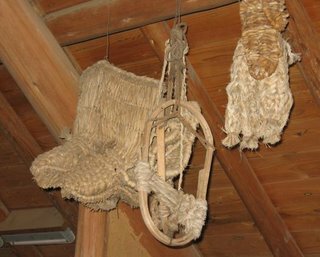 These bellows were made by skinning the hide of a deer. It is thought that bellows of this sort originated in China and were brought to Japan via the Korean Peninsula. Reliefs of leather bellows have been found carved hanging above Han Dynasty objects excavated in China. A late Han document reveals that iron was obtained and farm implements made using bellows that were operated by a water wheel. An air-pumping pipe, or tuyere, thought to date to the 2nd or 1st century B.C.E., was found in the ruins of a blacksmith's house in Gyeonggi Province, South Korea. It is believed that in the earliest era of iron-making, small furnaces would be built in drafty places such as mountain valleys, and the iron would be made using natural ventilation. However, in Japan it was unusual to find a large tuyere that assumed the use of natural breezes. Most furnaces used bellows. Perhaps these were leather bellows along the lines of the ama-no-habuki. According to Japan's oldest dictionary of Chinese characters, the Wamyo ruijusho of 930 C.E., the native Japanese reading of the Chinese character for bellows is fukikawa. Over time, the pronunciation changed to become fuigo. It may well be that the bellows came to Japan at the same time as metallurgical technology. The same early dictionary also has another entry for the same two characters, read as tatara (“foot bellows,” see section 1). It is believed that the foot bellows were developed for use in iron manufacturing because the leather bellows were too weak and inadequate for fabricating a metal with a high melting point like iron. Einosuke Murakami, a researcher interested in the history of steel manufacturing in Japan, notes that one can see two paths for the development of bellows around the world. One he describes as that of the saucer-style bellows found in the southern culture regions, including the ancient Orient and India. The other is the leather bellows found in the ancient northern cultural sphere. The Zhongyuan region of China is part of this latter group. The pump bellows was developed in the cultural border-crossing zone that stretches from this area in southern China to the Indochina Peninsula, a development that incorporated elements of bamboo tool-making culture into the leather bellows. This, it is hypothesized, may have been a step on the road to the development of the fukisashi bellows. In Japan, the bellows used for iron manufacturing in ancient times shifted over time from the leather bellows to the foot bellows, but by the medieval period it is the fukisashi bellows (a box-type air-pump) that become common. However, there were iron-manufacturing sites that continued to the foot bellows until early modern times, and the use of both foot bellows and fukisashi bellows persisted in iron-manufacturing use until the invention of the tenbin-fuigo at the end of the 17th century. Read the full story, start from HERE ! 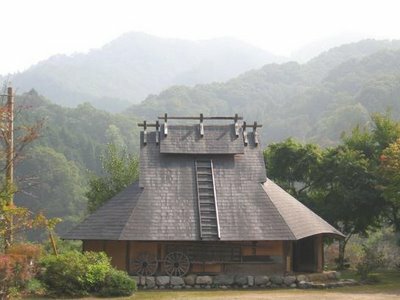 Look at the waterwheel in Koshihata village. October 2006. Oh, the Human Life ! To purify the bellows and the whole smithy. 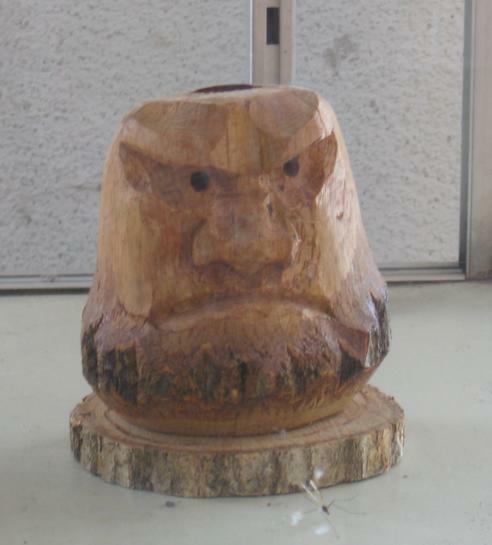 Various deities involved in sword making are celebrated in this festival. Most local blacksmiths used to make tools for agriculture like sickles and spades, and some special blacksmiths made the famous Japanese swords. 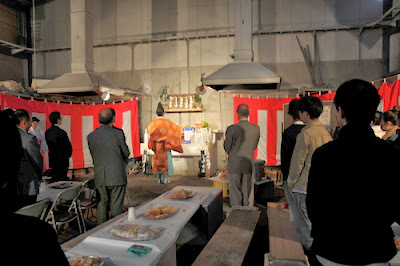 The festival is also celebrated at the "Bellows Shrine" Fuigo Jinja　鞴神社 in Osaka. Fuigo Shrine is one of the shrines in the precincts of Ikutama Shrine. Fuigo means bellows, tools to blow a fire. This is the god of metal work, and is worshiped as the patron deity of hardware industries such as steelmaking, machinery, etc. In Fuigo Matsuri ("bellows festival") held on November 8th, the fire to make a sword is lit. Here is more about the mandarins (oranges) offered to the Gods on this day. During the festival blacksmiths stopped their works and put out the fire in their smithy. And they dedicated the bellows and lots of oranges on the household Shinto alter in each smithy. The end of the festival the oranges were thrown to children, so many boys and girls use to gather in front of the blacksmith shops.
. shokunin　職人　craftsmen in Edo . "bellows", like "pants" and "slacks", is a plural noun taken as singular. Hence, there is no singular form. Since all bellows consist of (at least) two sides which are somehow squeezed together (even if one side is stationary and only one side moves, they are still squeezed together, as in the movable piston and the fixed walls of the fukisashi), "a bellows" is the correct form for the whole device. And when two fukisashi are on opposite sides of a furnace, it's now "two bellows, one bellows on either side of the furnace". (Might be interesting to talk to a person who repairs such things, and find out if they have a name for one single side or another of the contraption! Thanks, my friend for your information on the Bellows! Thank you ,Gabi san for your kindest information about Tatara. Once I have belonged to Carbon manufacturing company that provided bed carbon brick for tower furnes. In japan 60% of steel and iron company adapted our products. So I have interest in traditional Tatara very much. This hokku is from the twelfth month (January) of 1826, when Issa was living in his hometown, which was located on a post road and is known to have been the home of several blacksmiths who made all sorts of farming and other tools, utensils, and metal items for both humans and horses. 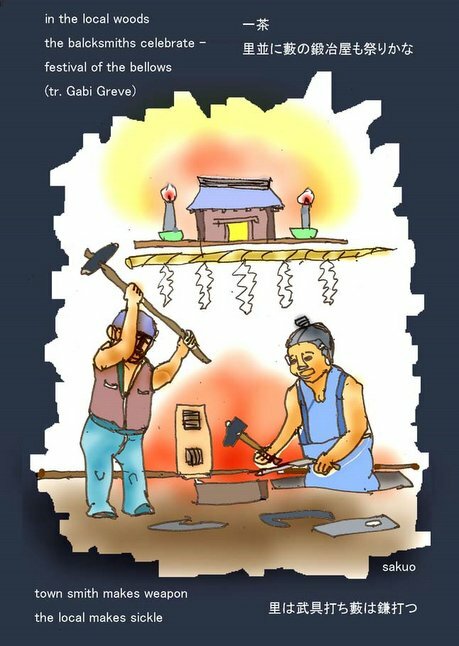 In the hokku Issa evokes a special New Year's ceremony (fuigo-hajime) in which a smith and his assistants start up the fire in their forge for the first time in the new year while they hand-pump the bellows, a wooden box with a handle for pumping at one end. The ceremony is named after the bellows, which stands for the whole forge, and its prayers are necessary in order to properly relight the forge fire that was put out at the end of the old year. 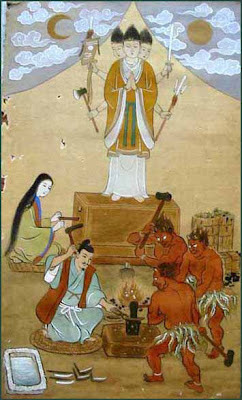 As they work, the smith and his assistants say prayers to the fire god Kojin and other gods, asking for safety and good fortune during the new year. To Issa, smiths and their forges are one of the most important sources of social wealth, good fortune, and progress, all of which he refers to with the phrase "a hundred fortunes," which means both boundless good luck and also a great many fortunes. Issa may be playing with sounds here, since fuku, 'fortune, good luck,' also seems to suggest another fuku, 'to blow.' The countless good fortune the forge will create this year begins with air blowing endlessly from the bellows onto the flames in the hearth. In traditional Japan smithing was regarded as a semi-religious activity that required spiritual purity and the invisible participation of the gods, and smiths wore robes that resembled those worn by Shinto priests. The photo at the link below shows a man who follows the traditional path of swordsmithing. To his left is a wooden box-shaped bellows, and with his left hand he pushes a handle in and out like a piston, modulating the air flow coming out of a tube protruding from the left wall of the small hearth. The string tied around top of the bellows and the white streamer dangling from it indicate that prayers have been made to the bellows. In Issa's time an assistant would usually pump air from the bellows box while a second assistant would help the smith hammer and cut the hot metal into shape. name for the blacksmiths in the Chugoku region. His shrine is in Shimane. tutelary of mines, metals, and the techniques associated with them. Tatara was likely imported into Japan from Korea by way of Shimane Prefecture, and seeing as the San’in region is rich with titanium magnetite, a necessary ingrediant for iron production, it took hold here very early on in Japanese history. and . Kanayago-kami 金屋子神 Deity of the Blacksmith . necessary elements for the production of iron with tatara bellows, and thus have been sword smiths. Maybe this is also the reaon why Maroko is called 金丸親王 Kanemaru or 金屋皇子 Kaneya (metal hut) in this region. The Chinese character 胡 in the name of demon 英胡 Eiko might be related to the 胡族 Ko clan from China, famous for their metal making technology.